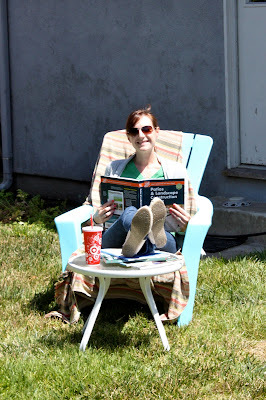 cute little life: Weekend Recap: Patios, Pits and a Contest! Weekend Recap: Patios, Pits and a Contest! There's something about a long weekend that gets me and the hubs all excited about projects! And this weekend was a big one. We've been talking about ripping up the grass in the back yard between the house and the garage to make a patio and this seemed like the perfect weekend to get started. Between the electric tiller, several shovels, and plain old man-power we were able to get the grass out and dig deep enough for our patio base. Here's the space before - we've got a nice big piece of grassy space to the right of the back door, so we weren't concerned about getting rid of this square. It's just begging for a fire pit or some patio furniture. I promise, I really did help. But we only have one electric tiller so while the hubs did some tilling, I did some research. Someone has to provide the brain power. The hubs's parents came up on Sunday to celebrate the his birthday - and to help dig our hole. They were fantastic! We wouldn't have accomplished as much as we did without their help. We found all sorts of treasures in the grass and dirt as we worked. My favorite is the little elephant. I know we found at least three more marbles in there, too. They were everywhere! That's as far as we got with the hole this weekend but we also spent a considerable amount of time between Lowe's, Home Depot, and the internet deciding exactly what we wanted to put in the hole. I had no idea there were so many kinds of brick pavers and choices for patterns, or that I'd even care so much when the time came! In the end, we decided on Harvard Pavers from Lowe's. They're a nice light red that will fade in the sun just a bit over time but won't be too dark against the light blue/grey of the house. The fact that our pavers are still sitting in the garage didn't stop us from setting up the fire pit and roasting up some hot dogs for dinner. And a fire pit isn't a true fire pit without some mallows. And now, on to the contest! I had no idea that this space would require quite so many pavers! So for those of you still reading, I've got a little prize for the person who can guess how many pavers we bought to make our patio! 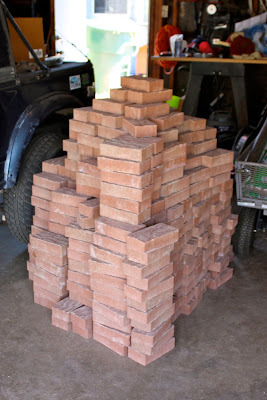 Here's a visual aid - my own little Mayan Ruin of bricks! You have until Friday, June 3rd, at 7:00p.m. (PST) to place your guess by commenting on this post. The person with the guess closest to the number of bricks in the pile wins a $5 Target gift card! One guess per person, please. I'll even throw in a brick if we have any extras. And you gets dibs on the first s'more next time we fire up the pit. How's that sound? 630! But I'm past the deadline!